Grape Valley is located on the west side of Flaming Mountain. After visiting Flaming mountain in the early morning, next to visit is Grape Valley. When we were in Flaming Mountain, there is not a single tree found but once we drove away from Flaming Mountain, you see lush greenery which is total contrast from earlier site. 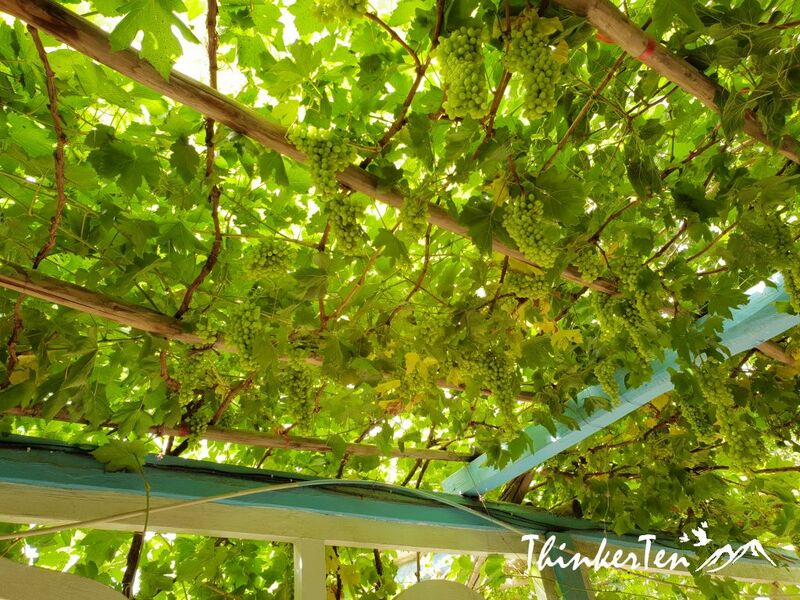 The air in Turpan is very dry and weather is very hot so it is ideal for growing grapes. The grapes also tasted especially sweet in this place! That is due to plenty of sunlight and little raindrops. Every year there are 300 tons of raisin produce here. People called Xinjiang as “The Grape Capital” of China. Grape culture has been existed for several hundred years. When you entered the valley, you will find yourself surrounded by green orchards and vineyards. You also feel very cooling and relaxing atmosphere over here. If you think the red grapes are sweeter then you are wrong. The seedless white grapes are the most popular one, it is called ‘Wuhebai’ in Chinese. It has the highest sugar content in the world. 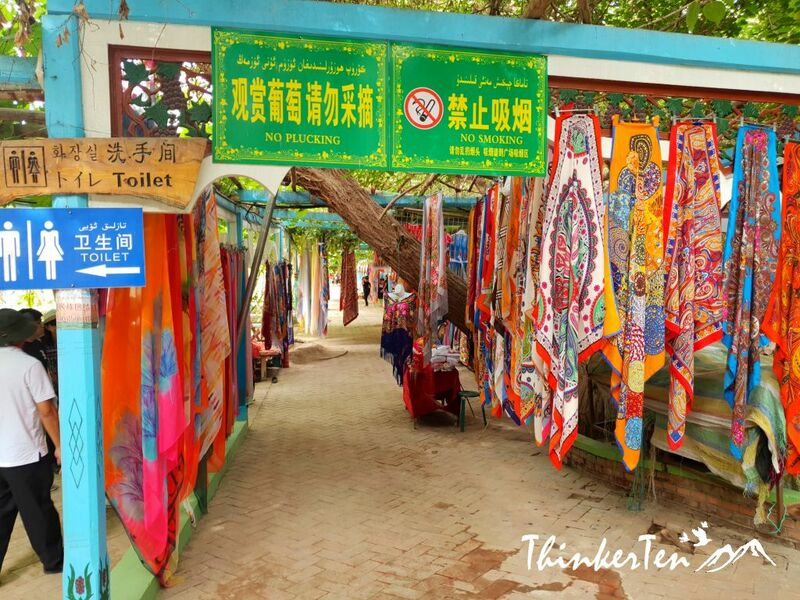 People in Xinjiang prefer the green than the red one. Local farmers also make raisins from the grapes in a special drying rooms. It usually takes about one month for the grapes to dry into raisin then get shipped all over China. The signboard telling visitors not to pluck the grapes. You will see Uyghur language at the signboard too. 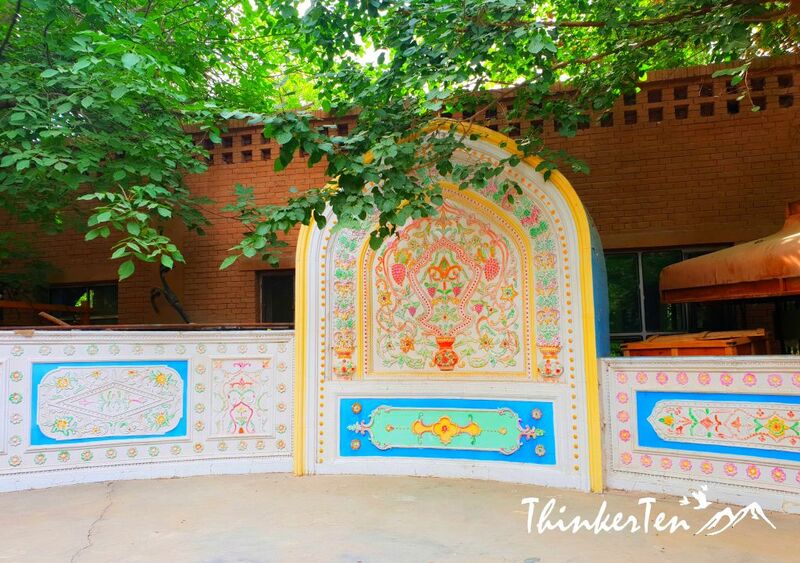 You can actually see grapes vineyards everywhere in Turpan Xinjiang, not just in the Grapes Valley. In fact, there are plenty of grapes vineyards outside of where we stayed in our hotel. It was ashamed that we didn’t get to taste any of the grapes as it was not during grapes harvest season yet. Grapes festival harvest in August. But we managed try out all sort of raisin in Turpan on my next visit at Uyghur’s village. However, it is still very interesting to see a grape valley in the middle of a hot desert! I guess the agriculture made possible by the Karez system bringing water to the valley! Oh no, you didn’t get to taste the grapes? They looked soooo good! I have never tasted seedless white grapes, I hope I get the chance to try them one day. That was a pity that we didnt get to taste the grapes as it was not during grapes harvest season. August is the grapes harvest season, go during that time to enjoy as much grapes as possible! Ancient people are always so wise! Ive done a bit of china, on my honeymoon, but not this region. The coloured fabrics all look so beautiful! Glad you have done some China tour before. China is so huge and all regions has their own culture and can be very different. For exmaple people in the south of China eat rice as their main meal but people from the north eat bread or noodles/flour instead. This part of China which I explored was in Xinjiang. This is another unique region and majority of the ethnic Uyghurs stay here. Uyghurs are colorful people and love to dance and sing! They look different from the majority Han Chinese. Their feature look like Turkish people or Central Asia. Uyghurs are Turkic ethnic group. The place looks looks amazing..lovely pics…the effort put in by the people to create the green belt in the mid if desert is great.. I totally agree with you. Grapes grow well in this piece of land, thanks to the Karez irrigation system done many thousands years ago. The photos tells so much about your story and experiences. Vineyard is always a good place to relax and enjoy the view. For someone who lives in South East Asia, vineyard is pretty luxury thing to see. We dont have vineyard as the weather here does not permit for grapes growing. 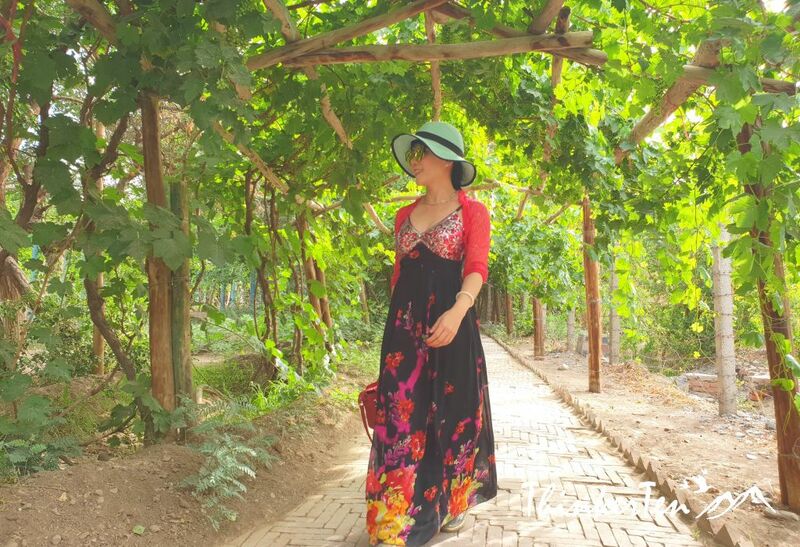 Yes, to be able to take a rest and enjoy the greenery in the vineyard in the middle of the hot desert was a pretty interesting thing during my tour in Turpan Xinjiang China. What a wonderful place to visit. I would have had a ball with all those vendor stalls. The vendor stalls are colorful people selling colorful stuff. Many of the vendors are Uyghur family. Uyghur culture are very colorful, the girls usually wear long braids and wearing very colorful long clothes. 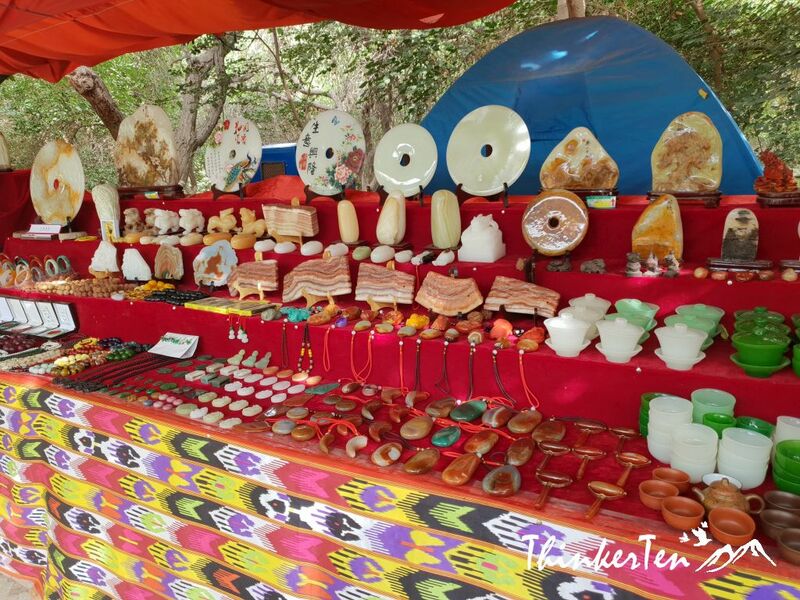 There are traditional musical instruments like Dutar, Rawap and Khushtar get displayed at the stalls for sales. I bought one rawap musical instrument, cost me about SGD 30 ( USD 25 ) It is a long necked stringed intrument used in folk music, look like a guitar but cuter! You got me running to my refrigerator with those juicy looking grapes. It’s quite interesting to see the grapes survive the hot desert. Thanks for sharing! Hahaha… I too was quite amazed these grapes do so well in the desert land! I have never been in China but I know there’s a lot of beautiful spots that can be visit in that country and one this is that place. I hope to be there one of these days so that I can explore that beauty of Turpan Desert. China is no doubt a great country to visit for it culture or scenery. As compared to 10 years ago, China has gotten more expensive to visit! You know they are doing well and their RMB is appreciating! My advise is to visit China asap before their money RMB get to high!! Lol. Such an amazing experience I’m sure and incredible how such dry hot place can grow fruit. 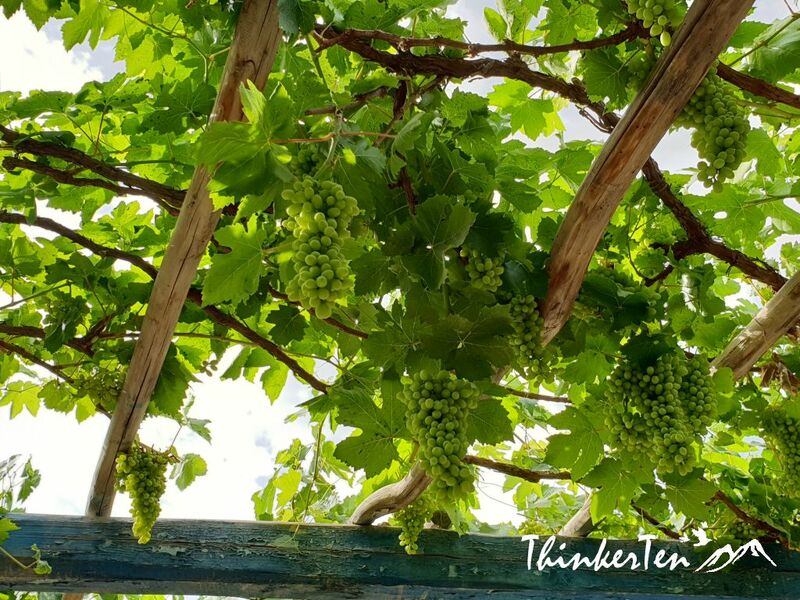 The weather in Turpan is the driest in China and very little rain so it is ideal for grapes. The grapes are very sweet too. Never been to China but I wanted to go there, The grapes looks delicious and the fabrics, gosh the fabrics and artifacts are very amazing. Reading this article made me more interested in China culture and everything about it. Fresh grapes are the best. That’s cool that there were some even outside of your hotel room too. Thanks for your comment. The hotel that we stayed in Turpan is just beside the grapes vineyard! Really nice thing to get up in the morning and welcome by the greenery vineyard! Yes, I totally agree if they offer to grape picking during the harvest season, that would be interesting and offer more engagement with the visitors. A really nice tour across an amazing rural Chinese vine yard thousands miles far from my country. It is really astonishing that how these greenery maintained its existance despite the presence of arid region near it. 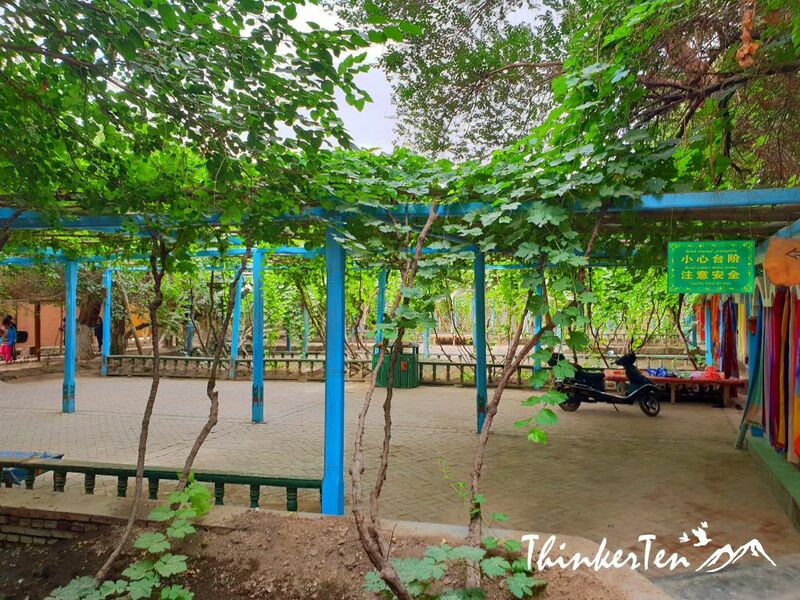 The whole town of Turpan is a living vineyard, pretty amazing site to see the green in the hot desert. Such magical creation! This grape valley looks quite splendid! Your pictures speak for itself how wonderful time you had out there! It is a little pity the grapes was not ripening yet. The harvest time is in August and we were there during Jun. However we get to see grapes hanging at the vineyard and it is truly beautiful! I really really love grapes! You have a great and beautiful shot! Hope to visit there someday. 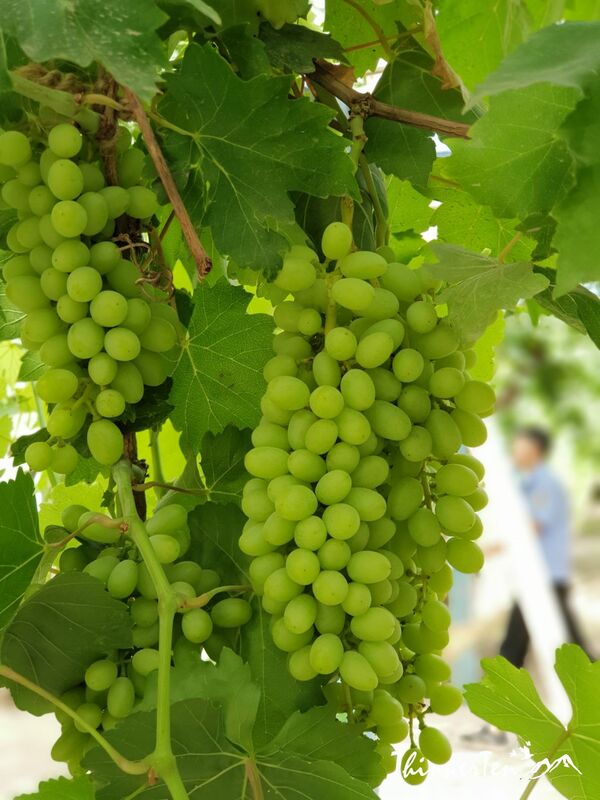 The grapes in Turpan Xinjiang are the sweetest in China and also Xinjiang produce most grape and ship all over China. Those grapes look so juicy and perfect! I’ve never heard of this place before but I would be adding it to my list of places to explore in China. Wow, your pictures look beautiful, like a paradise in the desert. I’ve never visited China, and didn’t realize they had a grape-growing region, so thank you for teaching me something new and expanding my perceptions! If I ever visit, this will be on my itinerary! Many people do not know China has a big region of grape vineyard. In fact China is the third largest raisin exporter after US and Turkey. But one thing weird – winery is not popular here. Probably people dont believe Chinese people can make wine and also China has lack of experience in this field as compared to the West eg France. 🙂 China people are good at making their traditional “kaoliang” alcohol instead, which has higher alcohol percentage up to 58%. The pictures make me feel like I am there, this sounds like a great place to go for a holiday. Truth is I have never seen grapes grow on trees, so this fascinates me so much, thank you for sharing. Seeing vineyard was not the first for me but the previous vinyard I visited in Australia was for winery where I got to taste the wines and cheese. Turpan grape valley has no winery at all 🙂 A little bit different experience from the vineyard from the WEST. This place looks amazing! My son would love it there, he LOVES grapes. Thanks for sharing! One thing to note is choose the correct timing if you wanted to taste the grapes. August is the grapes harvest season. Go during this season, you also got the enjoy the harvest festival which is quite fun I heard. Thank you for your beautiful comment. Plucking the grapes is a no no in this place. There is a signboard telling visitors penalty fine if you are too tempted and being caught plucking any of the grapes hanging there. Hahaha. That place looks so amazing! Those grapes look delicious! I would def try and eat them! never knew Xinjiang had a grape region! I traveled a lot in china when I did my junior abroad in Hong Kong in university. It’s sad you could not taste the grapes. They look so yummy. 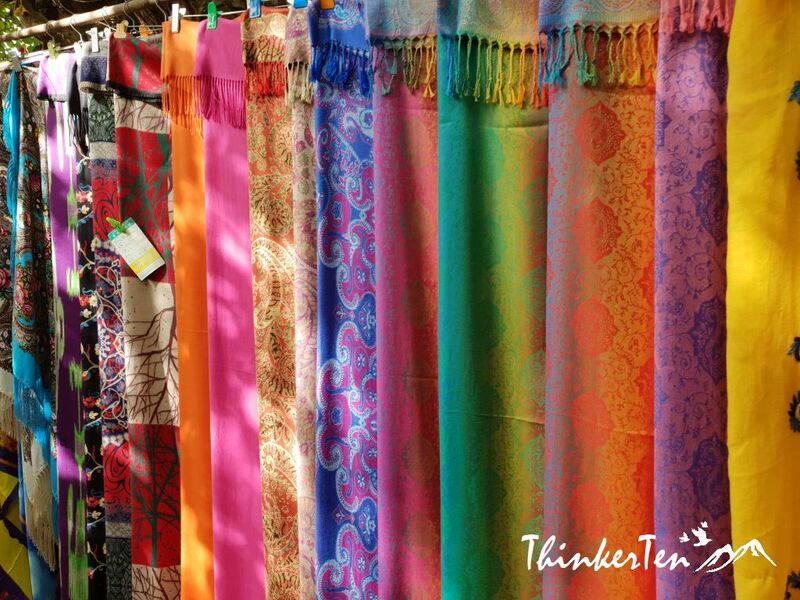 The colorful fabrics are also really beautiful. I would love to add some of the souvenirs from there to my collection. I bought a rawap, a Uyghur music instrument back home, it is similar to a guitar but different in shape. More like Banjo may be. Its a shame you didnt get to taste the grapes, but maybe a good reason to revisit during harvest season! I can’t wait to explore China some day … all your posts tempt me every single time. Love all the pictures in the post. Wow, I would love to taste those seedless grapes! I love grapes.I have tasted red, green and black grapes but no white ones.I loved this visit to grape vallet. I just love the pictures you shared to go with this post! They really help make the experience come to life. Grapevine in the desert. How ingenious! Shame you didn’t get to taste any of the grapes but it seems you had an amazing time and I guess that’s all that matters. China is fascinating isn’t it? I was there few years ago and totally loved the south but didn’t got the chance to explore this part of the country. going to bookmark it. South of China and North are totally different culture. People from the North are taller and also eat bread/noodles (flour) while the people from the south are shorter in build and prefer to eat rice instead.